We have selected two of Europe’s most experienced wood pellet boiler manufacturers Froling from Austria and Janfire from Sweden with over thirty years of product development behind them both. 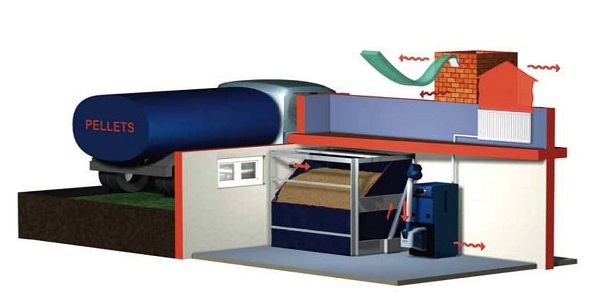 Today’s biomass wood chip and wood pellet boilers are of very high quality design, are reliable and can withstand the test of time while providing very clean emissions, good value for money and exceptional fuel economy. Should you wish to consider ETA, Windhager, Guntamatic, KWB, Extraflame, MCZ, or Hertz we will be only to happy to discuss customer requirements in UK, Scotland, England, Wales, Northern Ireland. Janfire Integral is a fully Automatic Feeding and Cleaning Wood Pellet Boiler. The Integral boilers ranges from, 10kW to 25kW output. The boiler is perfectly dimensioned to fit into the tightest of plant rooms, a micro pellet hopper is mounted on the side of the boiler or a bulk hopper situated in an adjoining room which is connected to the boiler via auger screw. Janfire’s HN burner is mounted on the front of the boiler, its very accessible for periodic service, should the need arise the burner can be easily swapped with a service exchange unit withing several minutes. Integral large capacity water storage in most cases necessitates the need for a buffer tank, Immersion coil and DHW combi function are optional. Out of hours service available (07833 324408 ).